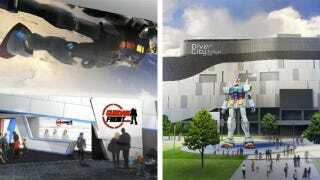 On April 19, a new theme park dedicated to Mobile Suit Gundam is opening in Japan called "Gundam Front". The small theme park will offer exhibits that allow visitors to experience the famed mecha. Located at a shopping mall in Tokyo's Odaiba, near the site of the giant Gundam, Gundam Front takes of 2,050 square meters of floor space. There are free exhibits as well as ones requiring an entrance fee. In that area, visitors can watch a film about the giant Gundam and peruse various Gundam artifacts. Tickets cost ¥1,000 (US$13) for adults and ¥800 ($10) for kids. The free area includes a Gundam model display and a Gundam shop. I have three words for this theme park—About. Effing. Time.